The college has a Board of Management, or the Board, constituted in accordance with Irish educational law. There are eight members on the board with four of its members are nominated by the Trustees (the Vincentians), two by the full time teaching staff and two by the parents. The Board is responsible for the conduct, management and financial administration of the college subject to the general supervision and control of the Trustees. In addition to their general responsibilities, as set out in the articles of management, the Board also has special responsibilities with regard to the upholding of the College Mission Statement and College Ethos, the observance of the liturgical calendar, the continuation of the college traditions and the induction of first time students and parents into a Vincentian college. The headmaster is responsible for the internal organisation, management and discipline of the college, subject to the direction of the Board. In this role he is supported by the deputy principal, assistant principals, special educational needs officer, guidance teacher and the remainder of the teaching staff. They have the responsibility to make sure that the decisions of the Board are carried out in the day-to-day running of the school. 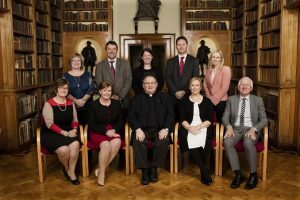 The President of the College, a Vincentian, acts as a representative of the Trustees at the College and he is also the head of the Vincentian Community who live at Castleknock College. Each student year group, from 1st through to 6th year, consists of between four and five classes. Each class is assigned a tutor from the teaching staff who has a pastoral role which consists of generating a positive classroom atmosphere, setting targets, ensuring that all students are content and organising events for their class. Every class in 1st and 2nd year also has two 6th year prefects assigned to it who get to know the students and makes sure that they are settling in well to live in the school. Each year is assigned a year head from the teaching staff which looks after the discipline, attendance and academic direction of the student year group. All the year groups in the college have their own parents’ core group which consists of volunteer. These are charged with maintaining positive channels of communications between home and college. Two representatives of each core group are on the Parents’ Representative Association (PRA) of Castleknock College. The PRA meets with the Headmaster about three-four times a year to ensure that there is good communication between the parents and the school. The students have an elected student council and this body has its own constitution and chairman and is facilitated by a member of the teaching staff. There is also a system of college prefects who are appointed by the headmaster after consultation with the staff and students of senior years.